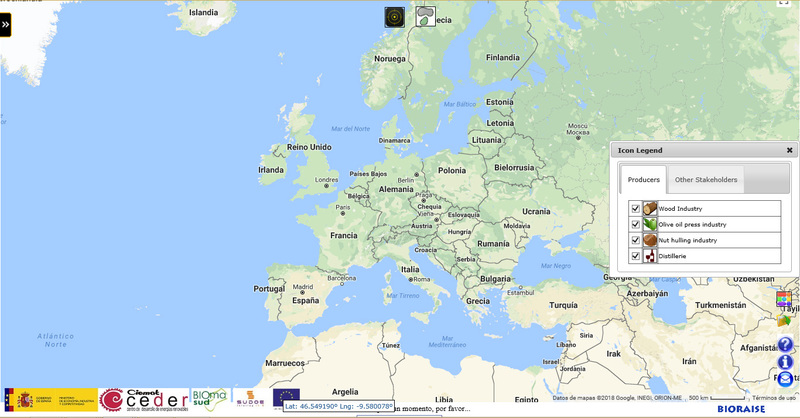 Within WP2, task 2.3 aims at the updating and extension of the web service BIORAISE to the participant countries of Southern Europe (Portugal, Spain, Italy, Croatia, Slovenia, Greece and Turkey), and France. The platform provides biomass resources information and exploitation costs, together with energetic content and stakeholders databases. The target is quantification of resources for residential heating solid biofuels production, from the field productivities to derive potential biomass resources and availability on the basis of environmental constraints and efficiency in the harvesting processes. Transport to transforming plants is considered in the logistics assessment of the biomass supply chain. The previous platform has been reviewed: the methodology has been improved under verification of previous and current results and a more diverse range of databases have been included. The analyses have been carried out over the latest version (year 2012) of the CORINE LAND COVER forestry, agriculture and shrubland surfaces. In the case of agriculture resources, EUROSTAT data regarding productivity and surfaces have been linked to the geospatial data of CORINE. As statistics refer to agriculture production, the biomass resources are derived from applying residue-to-production ratios. Efficiency rates related to harvesting processes are considered to compute the available resources that could be destined to bioenergetics uses. Therefore, potential and available biomass resources are given in tones of dry matter/year for the categories: irrigated crops, rainfed crops, rice, vineyard, orchards and mixed crops (agroforestry systems consisting of herbaceous crops under sparse tree cover). Forestry and shrubland resources have been computed for the categories of broadleaved species, coniferous mixed stands, shrublands (Scrub and/or herbaceous vegetation associations) and dehesas (agroforestry areas) in CORINE LAND COVER integrating the Pan-European Map of Forest Biomass Increment (Mg ha-1 yr-1) (https://data.europa.eu/euodp/es/data/dataset/38a3b611-eae1-423f-a4aa-c5cfdea03bd9 ) and net primary productivity NPP (g/m2 yr) (http://bio.discomap.eea.europa.eu/arcgis/services/NPP/NPP/ImageServer) with productivity tables derived from national forest inventories where available. Mean annual productivities values of residual biomass for each forest type were selected from the previous version (Esteban et al. 2010) and checked against these remote-sensing derived forest maps. As such products do not perfectly match the CORINE land uses surfaces nor dates, estimations were applied to derive potential resources (tones of dry matter/year). 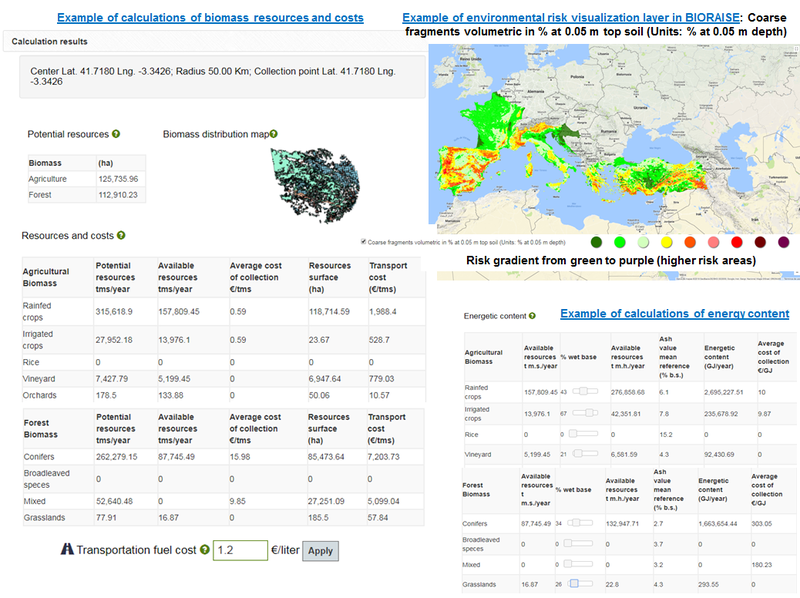 Available resources consider environmental restrictions related to slope, erosion risk values from the areas covered by the PESERA Soil Product (Soil erosion estimates (t ha-1 yr-1) 2000-2003 https://esdac.jrc.ec.europa.eu/themes/pesera-model) and the Soil organic carbon content (fine earth fraction) in g per kg at depth 0.30 m from SoilGrids (https://soilgrids.org/ ). In addition, dominant stands (> 50% principal species) of tree specific geospatial data from the JOINT RESEARCH CENTRE (http://data.jrc.ec.europa.eu/collection/fise) are shown in case the user wants to download the surfaces and apply a particular productivity rate. This version of BIORAISE implements also environmental risks. As there are no clear definitions regarding exploitation of resources for the diversity of stakeholders, it was decided to depict visually the vulnerability of the areas considering variables like slopes, depth to bedrock, coarse fragments, RUSLE equation erosion due to rainfall, net primary productivity, soil organic carbon content and soil erosion risk. It is an intuitive representation regarding a sustainable management. The resources exploitation logistic chain consists of harvesting, piling and transport costs, that BIORAISE produces as €/tonne of dry matter computations. The tool computes resources on the fly from user-selected points, considering a circular area, and provides the numbers for administrative regions (NUT2 regions, which is the statistical territorial units in the European Union databases). The energy content (GJ yr-1), and ashes content (% dry matter) result from average references obtained from laboratory characterization of selected samples (calorific values are updated according to moisture content choices). The stakeholders databases have been also extended and updated, consisting of producers (raw biomass producers, wood, olive oil, nut hulling, and wine sector –distilleries- industries) and other actors (e.g., equipment and machines for industry, services and facilities, manufacture of biofuels and biomass valorisation, biofuel dealers, research centres, large consumers, and BIOMASUD PLUS biofuel producers).